With the wealth of anti-ageing treatments and anti ageing products on the market, it can be overwhelming trying to decide which is the best solution to help fight the signs of ageing. For many, however, there is no anti ageing solution more effective than the range of cosmetic procedures on offer which can remove or repair the signs of ageing and enhance your looks. Muscle Relaxing Injections (Botox) – this improves appearance and removes fine lines and wrinkles by injecting a substance which relaxes muscles and helps crows feet, frown lines and other forehead lines to disappear. Microdermabrasion – also known as skin resurfacing, this technique uses a fine abrasive to exfoliate and remove the top layer of the skin, improving the appearance of dull, rough skin, uneven pigmentation, fine lines, acne scarring and revealing the fresh, new skin beneath. Chemical peel – similar to microdermabrasion (above) but using a chemical solution instead of abrasion to peel off the top layer of the skin surface. Injectable Fillers– also known as ‘dermal fillers’ – these inject a filler substance (e.g. collagen, hyaluronic acid or your own fat) under facial skin to plump up lips and fill in grooves, deep creases and skin folds, as well as smoothing away wrinkles and other fine lines. Facial Implants – similar to injectable fillers, this uses the filler in the form of an implant which is carefully placed under the skin through discreet incisions. Often used in the cheeks, jaw, chin or nasal area, it can restore volume and youthful fullness to the face. Thread Vein Removal – spider veins, thread veins and unsightly red blotches are removed by injecting a solution directly into the veins; lasers and intense pulsed light therapy may also be used, especially for tiny surface vessels on the face and legs whilst a Doppler ultrasound device may be used for larger veins. 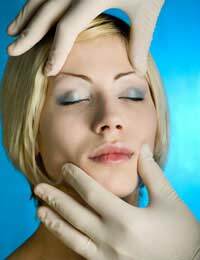 Facelift – also known as a rhytidectomy, facelifts help to improve sagging skin, deep creases and folds between the nose and mouth, excess fat and loose skin under the chin and jaw and ‘jowls’ created by loss of muscle tone in the lower face. Eyelid Surgery – the technical name is blepharoplasty and this procedure involves tightening up the loose skin around the eyes, both the upper and lower eyelids, to give you a more alert, youthful appearance. It can also help remove excess fatty deposits which lead to the appearance of puffy upper eyelids and reduce the appearance of “under eye bags”. Brow Lift – also called a forehead lift, this procedure tackles signs of ageing on the forehead and brow region – from frown lines and other forehead lines to sagging brows and hooded upper eyelids. Breast Lift – as the name suggests, this anti-ageing procedure helps to lift and firm the breasts by removing excess skin and tightening the remaining skin and tissue surrounding the breasts, giving you a younger, more pert profile. Tummy Tuck – a popular procedure for achieving a right, flat abdomen, this surgical procedure involves the removal of excess skin and fat and may also restore weakened abdominal muscles, resulting in a firmer and smoother abdominal appearance. Remember - regardless of the success and effectiveness of the cosmetic procedure you choose, it cannot protect you from the continuing ravages of time, gravity and the natural ageing process. It is important to adopt healthy lifestyle and dietary habits in order to maintain the benefits that you have achieved through these anti-ageing treatments.